When playing cards, luck plays a large part. Will you pick up the third King to have a three of a kind? No one knows! You need one more Heart-faced card to throw down a straight flush. Will it come up? Perhaps! See, that's the unpredictably fun experience when playing cards— you never know what you're going to get. But the shoe game is very different than any card game. With shoes, you want to know what you're going to get and need to know. Will they match the intended outfit and will they be comfortable are a few examples of shoe-related questions. Get them answered by choosing not to gamble with your fashion sense. Choose stylish shoes over everything else. Choose shoes to enhance your outfit. Choose the Heart Queen shoes for women. The faux leather shoes have a strap that's adjusted via the silver buckle. 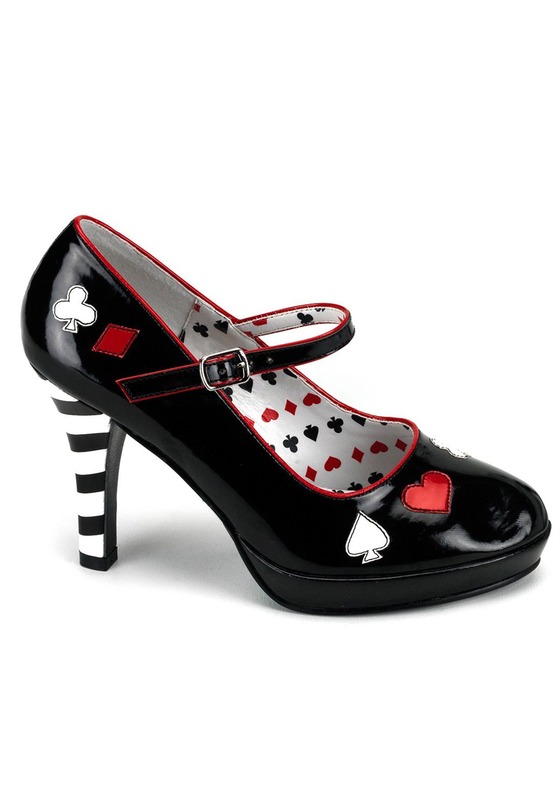 Card designs, hearts, spades, diamonds, and clubs decorate the interior, exterior while the heels are decorated with black and white stripes. Pair these Mary Jane style high-heels with the Queen of Hearts costume you like best to win first place in the costume contest.